With a lot of the buzz concentrated on Windows 8 tablets at IFA 2012, what about little old Android? Well, there was the Samsung Galaxy Note 2, of course, but Lenovo hasn't forgotten about Android tablets – though sadly they don't ship with Android Jelly Bean. The snappily-named Lenovo Ideatab S2110A is a 10.1-incher that joins the new 7-inch and 9-inch Ideatab A2107A and A2109A also launched here at Europe's biggest tech show. All three feature Android 4.0 Ice Cream Sandwich. The Ideatab S2110A is, says Lenovo, "a premium entertainment tablet." That may be so, but we think it probably deserves a less laudable title being, as it is, rather similar to the Asus Transformer, with a detachable keyboard dock. It's also matches the screen resolution of the original Transformer, with a 1,280 x 800 display outputting a brightness of 420nits. Lenovo claims a 178-degree viewing angle for the multitouch screen, and even we were in a fairly dark room while we were taking these shots it's an extremely bright display that seemed decent from all angles. As we've now come to expect from such devices, the keyboard dock doubles the battery life of the tablet with up to 20 hours. The keyboard itself is typical Lenovo - solid and functional, but still good to type on. The trackpad, too, doesn't feel at all flimsy. As for processing oomph, the S2110A features a Qualcomm Snapdragon S4 clocked at 1GHz. We did find this surprising since the smaller A2109A has an Nvidia Tegra 3 under the hood instead. The tablet detaches with a press of the button shown here at the top of the keyboard. Other specs include a Micro-HDMI port for outputting 1080p Full HD to a TV, as well as an SD card reader and USB ports. There's also a 5MP, auto-focusing rear camera with LED flash as well as a 1.3MP front-facing camera and 1GB of memory. 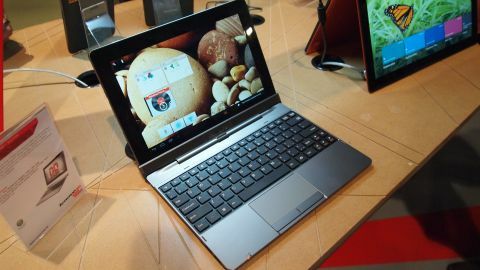 The Lenovo Ideatab S2110A UK release date and price are yet to be announced, although the tablet is already available in the US for $399.